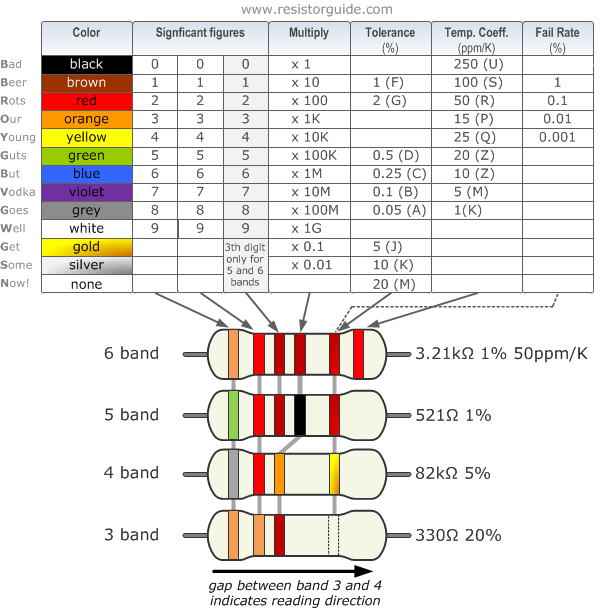 How does the resistor color code work? Resistor values are often indicated with color codes. Practically all leaded resistors with a power rating up to one watt are marked with color bands. The coding is defined in the international standard IEC 60062. This standard describes the marking codes for resistors and capacitors. It includes also numerical codes, as for example often used for SMD resistors. The color code is given by several bands. Together they specify the resistance value, the tolerance and sometimes the reliability or failure rate. The number of bands varies from three till six. As a minimum, two bands indicate the resistance value and one band serves as multiplier. The resistance values are standardized, these values are called preferred value. 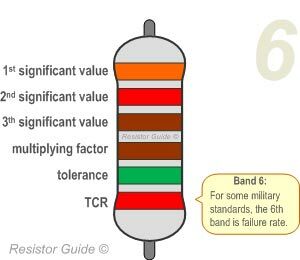 The chart below shows how to determine the resistance and tolerance for resistors. The table can also be used to specify the color of the bands when the values are known. 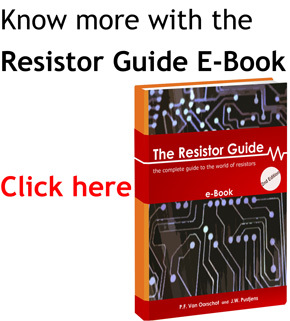 An automatic resistor calculator can be used to quickly find the resistor values. The reading direction might not always be clear. Sometimes the increased space between band 3 and 4 give away the reading direction. Also, the first band is usually the closest to a lead. A gold or silver band (the tolerance) is always the last band. It is a good practice to check the manufacturer’s documentation to be sure about the used coding system. Even better is to measure the resistance with a multi-meter. In some cases this might even be the only way to figure out the resistance; for example when the color bands are burnt off. The four band color code is the most common variation. 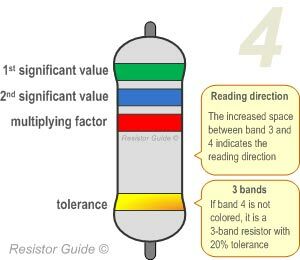 These resistors have two bands for the resistance value, one multiplier and one tolerance band. In the example on the left these bands are green, blue, red and gold. By using the color code chart, one finds that green stands for 5 and blue for 6. The value is thus 56·100 =5600 Ω. 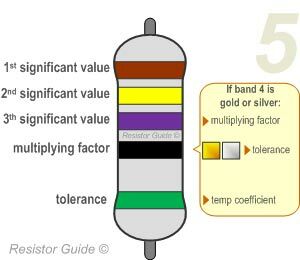 The golden band means that the resistor has a tolerance of 5%. The resistance value lies therefore between 5320 and 5880 Ω. If the tolerance band would be left blank, the result is a 3 band resistor. This means that the resistance value remains the same, but the tolerance is 20%. Resistors with high precision have an extra band to indicate a third significant digit. Therefore, the first three bands indicate the significant digits, the fourth band is the multiply factor and the fifth band represents the tolerance. There are exceptions to this. For example, sometimes the extra band indicates failure rate (military specification) or temperature coefficient (older or specialized resistors). Please read the section “Color code exceptions” for more information. Shown example: brown (1), yellow (4), purple (7), black (x1), green (0.5%): 147 Ω 0.5%. Shown example: orange (3), red (2), brown (1), green (x10), brown (1%), red(50 ppm/K): 3.21 k Ω 1% 50 ppm/K. Resistors that are produced according to military specifications, sometimes include an extra band to indicate reliability. This is specified in failure rate (%) per 1000 hours of service. This is rarely used in commercial electronics. Mostly the reliability band can be found on four band resistors. More information about the reliability can be found in the US military handbook MIL-HDBK-199. A resistor with a single black band is called a zero-ohm resistor. Principally it is a wire link with only function of connecting traces on a PCB. Using the resistor package has the advantage of being able to use the same automated machines to place components on a circuit board. Five band resistors with a fourth band of gold or silver form an exception, and are used on specialized and older resistors. The first two bands represent the significant digits, the 3th the multiply factor, the 4th the tolerance and the 5th the temperature coefficient (ppm/K). For high voltage resistors often the colors gold and silver are replaced with yellow and gray. This is to prevent having metal particles in the coating.